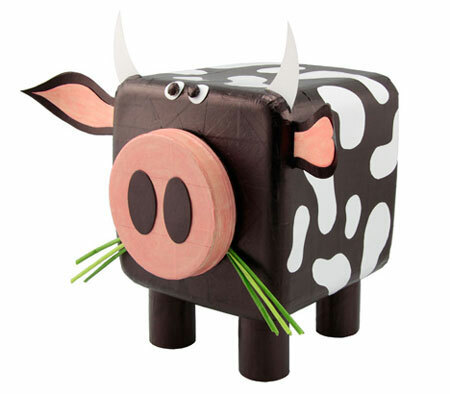 I’m going to build my own cow! I’d like to mention, as I’m typing this, my kids are watching the Curious George 2 movie. Just five minutes ago, a cow licked the face of the man in the yellow hat. We’ll all seen at least one cow today. For today’s cow sighting, I’d like to thank Knotrune (welcome back to the blogosphere, my dear). When I clicked on the link she emailed me, I had no idea what to expect but as soon as I saw it, I loved it. And who wouldn’t, look at this cow! Technically, it’s not a cow but a bull called Boris (just like my cat, who’s about that round too), which you can find on the Zippity Zoom website, along with all the materials and instructions I need to put it together. I’m seriously considering building one of these with my kids. Actually making it by myself might even be more fun. It would be my little pet cow project. What do you think? Just how big is that model? !